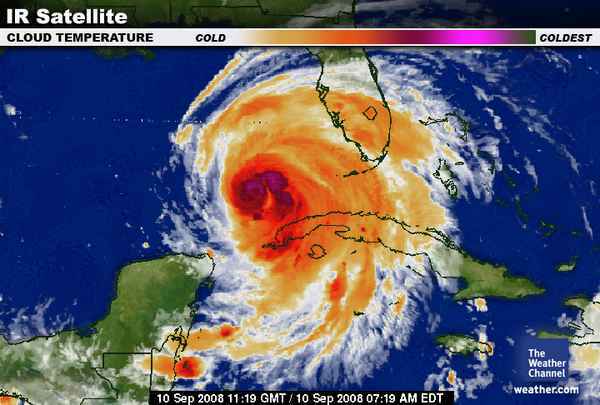 A tropical storm warning remains in effect from west of Key West to the Dry Tortugas. A tropical storm warning remains in effect for the Cuban provinces of Matanzas, La Habana, Ciudad de Habana, Pinar del Rio and the Isle of Youth. Hurricane-force winds extend 35 miles outward from Ike’s center. Tropical storm-force winds extend outward up to 175 miles. Ike is continuing to lash the western coast of Cuba. 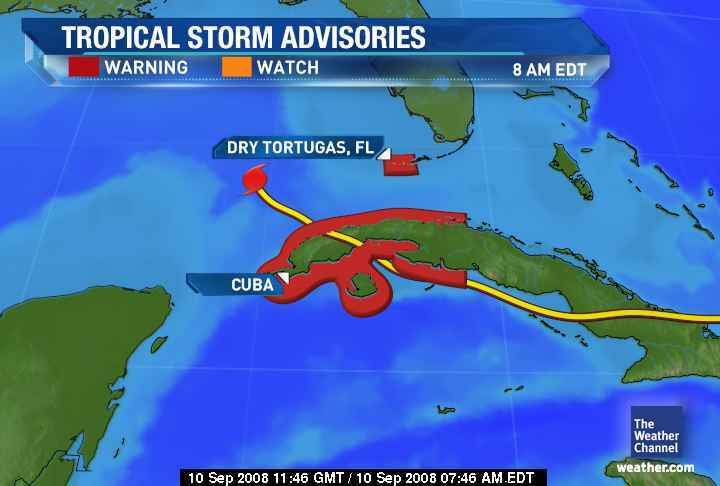 Update for Cuba: Ike will continue to bring strong winds and heavy rainfall to western Cuba this morning. Rainfall totals will average 2 to 6 inches with local amounts to 10 inches. This is in addition to the heavy rain that has already fallen and will continue the potential for life-threatening floods and mudslides. Update for Florida: Tropical storm conditions will continue to affect portions of the Florida Keys, especially the lower Keys, with squally showers and thunderstorms. Outer bands from Ike will continue to bring thunderstorms across southwestern Florida this morning. As Ike moves farther west, conditions should start to improve over the Keys and southwestern Florida later today into Thursday. 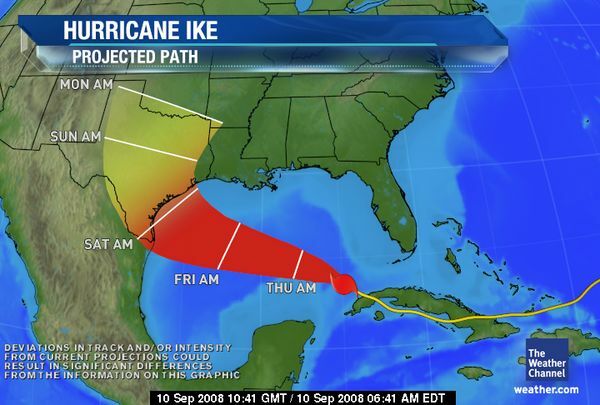 Future path of Hurricane Ike: Ike is still being steered by a strong upper-level high that extends across the northern Gulf of Mexico and the Deep South of the United States. This ridge should remain in place through Friday and keep Ike on a west to west-northwest course. Intensification likely: Ike has begun to reintensify over the eastern Gulf of Mexico. Conditions will be favorable for intensification over the next couple of days as water temperatures along Ike’s projected track are at least 82 degrees and wind shear remains weak. 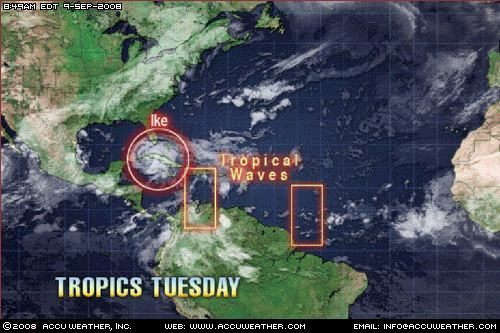 Ike is expected to intensify to a Category 2 hurricane later today or tonight. We believe that, given the favorable conditions, Ike should be a major hurricane of at least Category 3 status later on Thursday or Thursday night. Projected U.S. Landfall: The AccuWeather forecast is for Ike to remain a major hurricane when making landfall along the Texas coast late on Friday night or Saturday morning. There is some chance for Ike to become a Category 4 hurricane; however, environmental conditions may become a little more unfavorable by Friday. Recent computer guidance has shown a great deal of variation and the exact landfall location remains very uncertain. 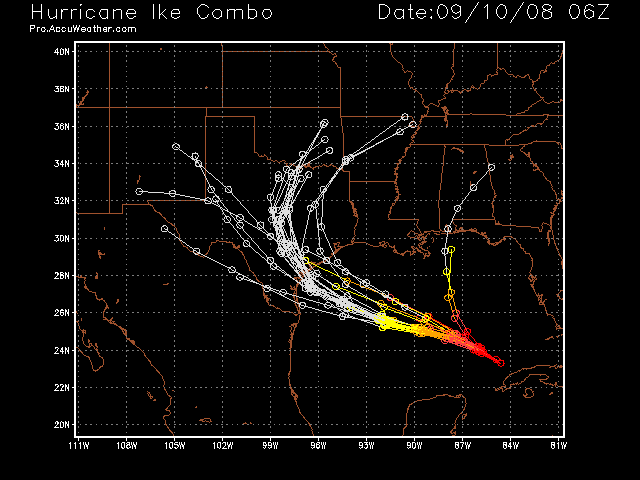 The best estimate right now is for landfall somewhere between Brownsville, Texas, and Freeport, Texas. It should be noted that this is subject to change should conditions change. One should not focus on an exact landfall location at this time and all interests along the western Gulf coast should monitor the progress of Ike closely. 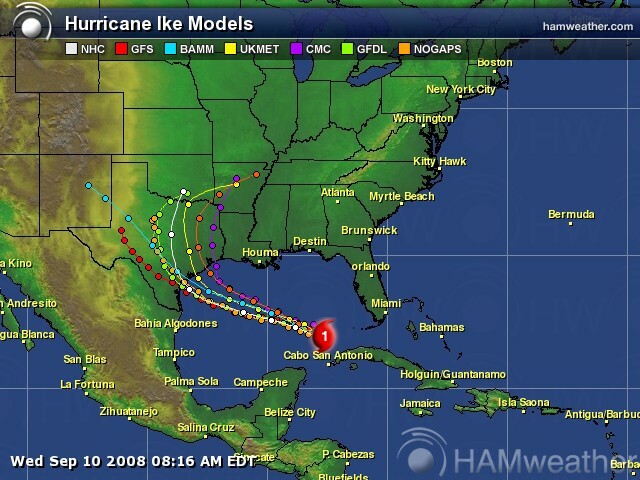 This entry was posted in Hurricane Season, My2bucks Eye On The Tropics, News, weather and tagged hurricane computer models, Hurricane Ike, Hurricane Ike computer models, Hurricane Ike Spaghetti Models, spaghetti models, Tropical Storm Ike, Tropical Storm Ike Spaghetti Models. Bookmark the permalink.